After taking a bit of a break from the adult thriller genre, I figured I would jump back into it with this book. While it didn't necessarily live up to all of my expectations, it was a unique and interesting story that I enjoyed! 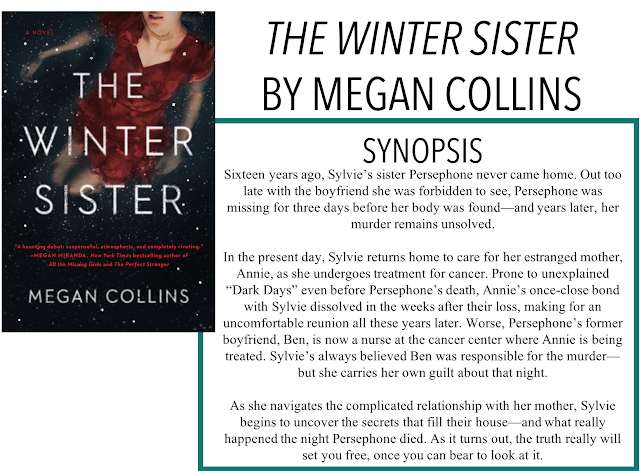 I am back with another book review, The Winter Sister by Megan Collins. Thanks so much to Simon and Schuster Canada for sending me an eARC of this book for an honest review, as always, all opinions are my own. This story follows Sylvie - at first in two timelines, but mainly in the present. When Sylvie was fourteen, her older sister Persephone snuck out to see her boyfriend. Much to Sylvie's dismay, this had become a regular occurrence after their mother forbid them from dating. However, that night, Persephone didn't come back. Three days later, her body is found in the snow, strangled to death. Desperate to protect her sister Sylvie tries to convince the detectives to look into her sister's boyfriend, Ben, who just happens to be the son of the town's mayor. Now, sixteen years later, Sylvie has to return home to take care of her cancer-stricken mother - and confront her sister's cold case murder investigation. I really liked how Collins told this story. So often with this sort of set up, the childhood trauma and then present, adulthood life, the story alternates chapters between the two, which can be distracting. Collins does a great job of keeping the story flowing in a way that gives all those details but doesn't toss around the timeline. Obviously, this is a traumatic and terrible story with the unsolved murder of Persephone but I just wasn't really able to connect with a lot of the characters of the book. I couldn't bring myself to really feel much sympathy for Sylvie and Persephone's mother, she really showed her true colours, especially at the end. Sylvie herself was an alright character to me and I didn't love the romantic relationship that develops for her... it just really weirded me out. I'm not sure if it was a stylistic choice or not but half the time I was reading this, it didn't feel like I was reading a psychological thriller. I would say it is definitely a slow burn. Don't get me wrong, things are happening but they are more peripheral. I think because there wasn't an on-going investigation, the fact that it was sixteen years after her death, that things felt more relaxed. Things obviously picked up in the end as the story started to unravel but until that point, it almost felt like a contemporary with darker issues. Overall, I wouldn't say this was my favourite book but I did enjoy it and I know others will to if this is their sort of thriller.